Above: Among America's favorite Awesome Backgrounds is this scene from the Grand Canyon. Some of nature's most Awesome Backgrounds for desktops, artwork or just sheer viewing pleasure come from Arizona's Grand Canyon. Pictured here is a spectacular detail view of the Canyon. Visitors especially enjoy the Sky Walk, which resembles a huge magnet jutting out from the edge of a cliff. Visitors are invited to dizzy themselves peering over the railing into the abyss. 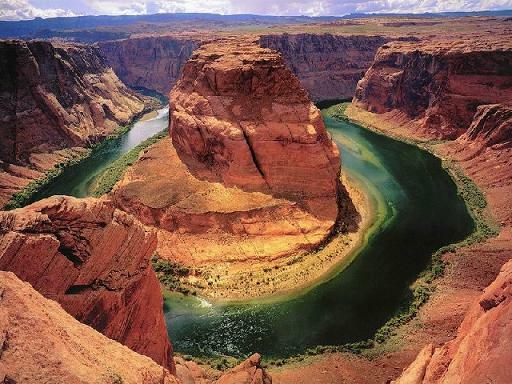 The Grand Canyon is a steep gorge carved by the Colorado River over many millions of years. It is located in Grand Canyon National Park in northwestern Arizona. Nearby cities include Flagstaff, Williams, and Sedona. They are all located less than a hundred miles south of the canyon's east end. The Grand Canyon is about 277 miles long, and ranges in width from a quarter mile in some places to about fifteen miles in others. It stretches from the southeastern Nevada border (east of Las Vegas) to north central Arizona (north of Flagstaff). Some parts of the Grand Canyon are more than a mile deep. The inner part of the Grand Canyon exceeds 120ºF during summer months, and often drops well below 0ºF during winter months. The Grand Canyon is home to more than 75 different species of mammals, 300 species of birds, fifty species of reptiles, five species of amphibians, and 25 species of fish. Animal species most commonly found in the Grand Canyon are Mule deer, desert bighorn, bobcats, coyotes, rabbits, bats and squirrels. The site also features endangered bird species such as the Grand Canyon bald eagle and the Willow Flycatcher. President Benjamin Harrison initiated the establishment of Grand Canyon National Park and declared it as a forest reserve in 1893. Man-made Grand Canyon tourist attractions include the El Tovar hotel (built in 1905) and the Desert View Watchtower (built in 1932). Also interesting are the Railway depot, Hopi House, and Verkamp's Curios. The Grand Canyon receives about five million visitors each year. The Grand Canyon is usually listed as one of the 7 natural wonders of the world. Low-Cost Auto Insurance in All 50 States and Washington DC. ﻿Wholesale Factory Outlets in every state.